This quintessentially casual Woodstock retreat is itself a child of the â60s. A unique contemporary nestled on a quarter acre in the woods w/a stream in back & welcoming koi pond in front. Inside a modern kitchen has stone counters & a pass-through to the sunken living room, large dining room, family/game room w/kitchenette, first floor bedroom & full bath, two upstairs bedrooms share a full bathroom, a finished loft currently serves as a yoga/meditation space. Outside a sun-dappled yard & bluestone patio are perfect for entertaining, family grilling, and individual chilling. 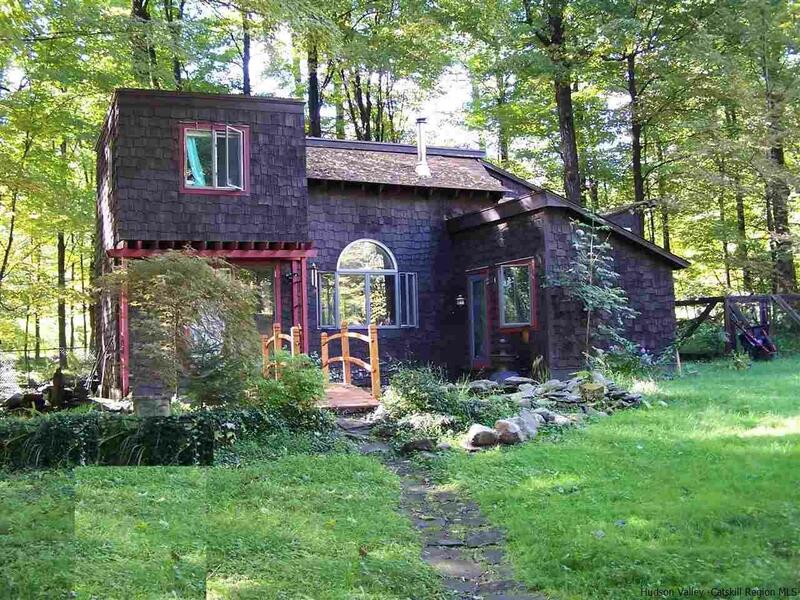 This year-round home is suitable as a primary residence or country get-away two hours from NYC. Walk, bike, or drive into the village of Woodstock â quaint & bustling w/many restaurants, shops, & services. The Trailways bus from Port Authority in NYC stops right on Main Street. Discover this special house in the crisp country air of winter and be home next summer for some well deserved R&R.